John Dillard, co-Founder and President of Big Sky Associates, talks about decision making in uncertain future scenarios in Decision Trees Help Provide Strategic Answers for Uncertain Scenarios. I like his post, because it touches upon a subject that often comes up in my conversations with my clients. Life in general and the business world in particular, is full of uncertainty. Business managers, especially in times of rapid change, feel uncomfortable making decisions when faced with the unknown. Sure, they can deal with problems when the objectives, variables and the parameters are clear. What about when they are not? It is never easy to solve half an equation. One needs to make assumptions, and making assumptions is almost always risky. In such situations, concepts like expected value, decision tree and scenario analysis become very useful. By laying out feasible alternatives, even in multiple layers, and quantifying their outcomes as well as the probabilities of these outcomes, the chaos of the world of possibilities can be transformed into the order of the decision tree. 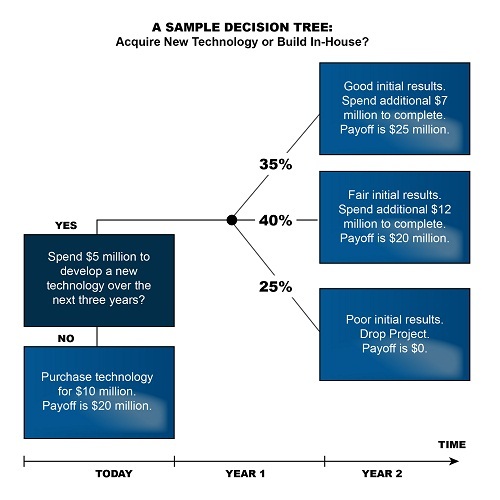 Decision trees are especially useful when evaluating investment alternatives and deciding on strategic moves.